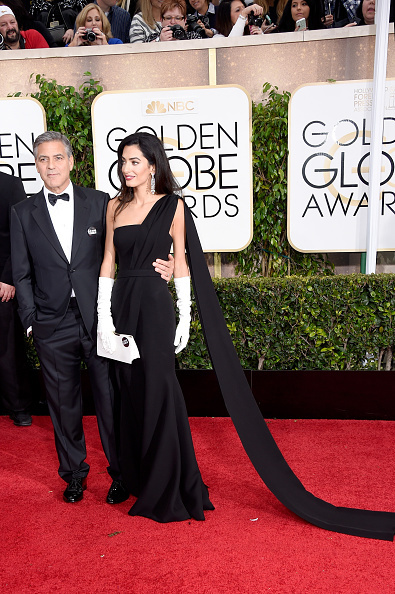 Jennifer Aniston has praised human rights lawyer, Amal Clooney - who tied the knot with George Clooney in September last year - for handling her first Hollywood event, the Golden Globes, so well. The 'Cake' actress praised the human rights lawyer - who wed George Clooney, 53, in September last year - for handling her first Hollywood event so well. When asked what she thought about Amal, 36, Jennifer joked: "Hey, I think if you can save countries, you can walk red carpets. "I think that's probably a skip in the park for her." The 45-year-old actress - who attend the ceremony alongside her fiancé, Justin Theroux - also revealed she was "humbled" by the support she had received from her loyal fans. Praising those who she was nominated alongside for Best Actress in a Motion Picture Drama, she said: "There's some extraordinary women that are out there right now and I'm just honestly thankful to be standing right here. I never even thought that would happen." When asked about shaking off her alter ego of Rachel Green, the character she played in the sitcom 'Friends' for ten years, she added to Entertainment Tonight: "Let me tell you, after doing it as long as I've been doing it - I feel still so excited that there can be exciting new discoveries and I can keep going and keep inviting myself. "It humbles me that I have such support. It's incredible."